Last week amidst a measles outbreak in Christchurch, social media has been in full on discussion about vaccines with an article by TV1 news featuring Nigel Latta, another prominent person weighing in on a borderline push insisting that parents vaccinate their children. To see what is behind this new enlistment of support to bully you into vaccinating, see the video titled Free Speech and Shutting Down the Vaccine Debate by Truthstream Media. Google, Amazon & Facebook are all involved in this. And meanwhile, Duncan Garner has labeled anybody who refuses to vaccinate a ‘murderer’. Note, nary a mention of all the babies who have died following vaccination. Let me say at the outset, vaccination in NZ is not compulsory. See the official email from the NZ Health Dept website below. These prominent persons who are waving their self assumed ‘authority’ over you & your families under your noses, should in my opinion concentrate more on urging parents to obtain all the scientific literature from both sides of the vaccination issue before proceeding with their own informed & well researched decision that will benefit their children. Same as we should on any proposed medical procedure. Instead, Latta has likened such thinking folk to flat earthers. Recently we posted a video featuring talk back radio where a young mother who is also a psychology graduate & whose six week old baby was vaccine injured, made a plea for full disclosure by the health professionals of the possible risks vs the possible benefits of a vaccine. One hour after vaccination, this young mother says her baby woke up screaming & over two days turned into a floppy rag doll with a high pitched shrill moan … his brain was swelling. Listen to her speak in the following short clip. So according to Latta’s thinking, anybody who questions this medical procedure (what are the contents of the vaccine? Are there any side effects to consider? and so on) are actually “as legitimate as those at the Flat Earth Society”. Surely this young woman’s desire to be informed of the said risks vs benefits should not qualify her to be considered by health professionals as a conspiracy theorist? I’m very disappointed as I really admired Latta’s work with the Shadowlands series. Yet on this issue he clearly is not for our parental right of choice. There are now enough testimonies from parents of deceased babies & disabled children who wish they had been informed of the risks and who cannot now turn back the clock. If you doubt that please visit the Vaxxed Youtube channel & hear all the heartbroken parents speaking out. View the before & after videos of their precious little ones, changed forever. Any parent’s worst nightmare. The disturbing thing about that is their numbers are increasing. To not weigh up the risks of injury versus the benefits, in light of the current available information, would in my opinion be very irresponsible. This is not however how the medical establishment sees this. They want you to get the vaccine, no questions asked. Hitler would be proud. My daughters were approached by nurses at school “gently” encouraging them to persuade me, they also rang me to question my judgment….I’M THE PARENT not them how dare they question my decisions for my daughters. I’ve had lengthy conversations with my 11 and a half year old about this..today he said his teacher was telling them all they have to get vaccinated to keep them safe and asking them questions like “you do want to be safe and live don’t you?” , the teacher proceeded to tell the kids they needed to go home this evening and tell their parents that they need to make an appointment with the doctor asap…they have a vaccination program for the year 8s at his school and I told him he has my full permission to refuse and if they pressure him to demand to be able to call me or run away from the area that they are vaccinating. I received HPV vaccination over 12 years ago now, when my mum sent in a form that said she didn’t consent to me receiving it. I gave it to the nurse who tossed it in the bin, then gave it to me anyways.. when I got home I told my mum & the next day she called a meeting with the school principal, vice principal and all my teachers and went offfff. After that day they didn’t even bother giving me any forms for vaccinations because they didn’t want my mum to come down to the school again. When my boy was attending Intermediate school they were being targeted for diptheria, tetanus pertussis (triple vaccine) and as a parent I rang to ask where was the info for the parents. Answer was “oh we don’t do this anymore and hardly anyone turns up” So I was invited along to an assembly where they addressed all the kids. My boy had been sent on an errand unbeknown to me and when the session was finished he turned up almost in tears as he had “missed out”. Now the session included a video of propaganda showing an old school photo of a class with circles around a few pupils (can’t remember which way around it was to use as an example who was spreading disease). The Deputy Principal allowed for questions of the 2 DHB nurses present. One South African boy asked what bad reactions could happen and the nurse had to acknowledge “anaphylactic shock”. I raised my hand to ask a question and the DP gave me the most evil look then promptly closed the whole session down and sent everyone back to class. What hope is there if the teachers are propagandised leaves me worried and wondering …..
Parents now also need to be aware that some children are being prescribed anti-depressants without parental consent. Clearly some medical staff are taking it upon themselves to apply pressure to children which is not acceptable. As to prescribing anti depressants without parental consent, that is definitely crossing the line. Watch your children parents. Listen to them. And be involved & know what is happening at their schools. Make it clear to those concerned what your expectations are regarding any health procedure. Please advise if immunisation in New Zealand is compulsory or that it is up to the person and/or parents to make that decision. Your website is not very clear on all of this. Thank you for your email. Getting immunised is voluntary in New Zealand, and it is an individual’s (or parent’s/guardian’s) choice whether or not they or their child agree to being immunised. Note under the Health (Immunisation) Regulations 1995 all early childhood education centres and primary schools must maintain an immunisation register, and may request that the caregiver provides their child’s immunisation certificate or record that the child is not immunised. Your health practitioner will be able to provide you with information that will allow you to make an informed choice. Health professionals have a duty to give honest and open information about any medical treatment, which includes immunisations. This ensures that the individual or parent/guardian is able to give their full consent to the immunisation. The individual or parent/guardian needs to understand the benefits and risks of immunisation, including those to the child and their community, in order to make an informed choice and give informed consent. The information about immunisation on our website is based on the overwhelming body of scientific evidence that shows the benefits of immunisation far outweigh its risks. This position underpins the health systems of every country in the world. Another website you may find useful is that of the Immunisation Advisory Centre (IMAC), which provides independent information about vaccine-preventable diseases and the benefits and risks of immunisation (http://www.immune.org.nz). Note: Equally disturbing as all of the above is the strict censorship that is happening around the Christchurch shooting that came on the heels of this. There’s been huge censorship right across social media & elsewhere of late, such that it surely raises red flags of caution. Changing the natural history of cancer that increases in frequency and occurs faster. It takes a long time to affirm that a preventive action really protects. But the failure of this supposed protection can sometimes be very quickly obvious. To prove that the Titanic was truly unsinkable would have required decades of navigation on the most dangerous seas of the world. Demonstrating that it wasn’t, took only a few hours … This » Titanic » demonstration is unfortunately reproduced by the Gardasil vaccination. Evidence that vaccination increases the risk of invasive cancer can be rapid, if the vaccine changes the natural history of cancer by accelerating it. The analysis of trends in the incidence of invasive cervical cancer published in official statistics (registers) was studied in the first and most fully vaccinated countries (Australia, Great Britain, Sweden and Norway). Unfortunately, it’s the case for HPV vaccines. Pre-vaccination period: spectacular success of cervical smear screening with a steady decrease in the rate of invasive cervical cancer. In all countries that performed smear screening, the pre-vaccination period from 1989 to 2007 was marked by a significant decrease in the standardized incidence of cervical cancer. Globally, in the countries that used smear screening, the average annual rate of decline was 2.5% between 1989 and 2000 and 1% between 2000 and 2007, resulting in a total decrease of nearly 30% across 1989-2007. Era of vaccination: reversal of the trend. Gardasil’s prevention failure erases the beneficial effects of the smear and accelerates the onset of cervical cancer. Since vaccination, in all the countries implemented with a large vaccination program, there is a reversal of the trend, with a significant increase in the frequency of invasive cancers in the most vaccinated groups. Let’s look at OFFICIAL sources. AUSTRALIA: contrary to the FAKE NEWS OF THE MEDIA AND POLITICS, REGISTER DOES NOT SHOW CANCERS OF THE CERVIX DISAPPEAR, BUT INCREASE. Australia was the first country to organize routine immunization for girls (April 2007 school-based program for females aged 12–13 years, July 2007 time-limited catch-up program targeting females aged 14–26 years) and then for boys (2013). According to the last Australian Institute of Health and Welfare publication (2018 publication describing the detailed rates until 2014) , the standardized incidence in the overall population has not decreased since vaccination 7/100000 in 2007 versus 7.4 in 2014. This global stabilization results from two contradictory trends that only appear by examining trends, according to age groups. 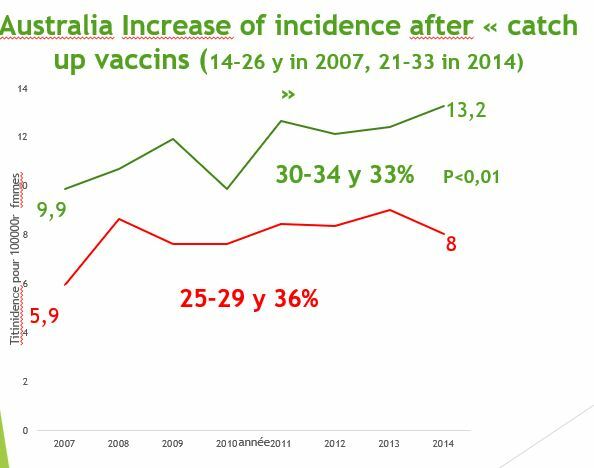 113% increase (from 0.7 to 1.5) in groups aged 20 to 24 more than 80% of them were catch up vaccinated when 13 to 17 years old. But, as the figures are very small, this increase does not reach statistical significance. About a third increase for 25-29 group (from 5.9 to 8,p=0.06) and for 30-34 (from 9.9 to 12.4 c=0.80 p=0.01) less vaccinated. These increases are statistically significant cannot be due to hazard. This increased risk of cancer following vaccination was dramatically illustrated by the sad story of Sarah Tait, olympic rowing champion, at the 2012 London Olympics. This champion saw her life shattered in full glory: she suffered invasive cervical cancer a few years later, being vaccinated and died at age 33. Of course, we don’t know if vaccination was the direct cause of her cancer, but she has, statistically, a one in two chances of having suffered from a cancer linked to vaccination (to be part of the 113% increase of cancer observed after vaccination). In addition, we remark that cancer appears very early in this woman. In UK, a national program was introduced in 2008 to offer HPV vaccination routinely to 12–13-year-old and offer catch-up vaccination to girls up to 18 years old. The UK national program initially used the bivalent HPV vaccine (Cervarix), but, changed in 2012 to use the quadrivalent vaccine (Gardasil). HPV vaccination coverage in England has been high with over 80% of 12–13 years old receiving the full course coverage. The catch-up cohort has been lower covered (ranging from 39% to 76%). Since the vaccination, the standardized incidence in the overall population increased from 9.4 per 100000 in 2007 to 9.6 in 2015. We observe contrasting trends between the age groups. 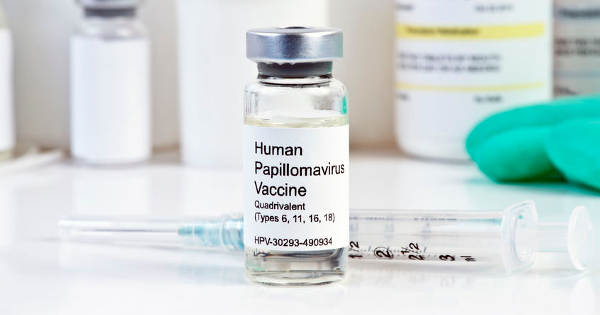 Vaccination promoters expected cervical cancer rates decrease in women aged 20 to 24 from 2014, as vaccinated adolescents enter their second decade. However, in 2016, national statistics showed a sharp and significant increase in the rate of cervical cancer in this age group. This information of 2016 has unfortunately not been publicized. They could have served as an alert. Women aged between 20 and 25 years, vaccinated for more than 85% of them, when they were between 14 and 18 years old, have seen their cancer risk increase by 70% in 2 years (from 2.7 in 2012 to 4.6 per 100,000 in 2014 p = 0.0006) and those aged 25 to 30, ( aged between 18 and 23 at the time of the vaccination campaign) have seen their cancer risk increase by 100% between 2007 and 2015  (from 11 / 100,000 to 22 / 100,000 ). Women 25 to 34 years, (less vaccinated, only exposed to some catch-up vaccinations), have seen their risk increased by 18% (from 17 in 2007 to 20 in 2014). (-13% for women aged 65 to 79 and -10% for those over 80), most likely because continuation of smear screening. SAME PARADOXICAL PHENOMENON OF GARDASIL IN SWEDEN: THE RATE OF CANCER INCREASES IN THE VACCINATED AGE GROUPS. ALERT! In Sweden, Gardasil has been used since 2006. The vaccination program was rolled out in 2010, with vaccination coverage of 12-year-old girls approaching 80%. In 2012-2013, with a catch-up program, almost all girls aged 13 to 18 were vaccinated. In contrast, as in Australia and Great Britain, a decrease in the incidence of invasive cancer has been observed in women over 50, a group that has not been included in the vaccination program. The incidence of invasive cancer of the cervix decreased between 2007 and 2015 by 6% for women aged 50 to 59 (from 14.24 to 13.34), and 4% for those aged 60 to 69 (12.63%). at 12.04,) 17% for those aged 70 to 79 (from 15.28 to 12.66) and 12% for those over 80 (from 15.6 to 13.68). Cancer registry shows an increase in the standardized incidence of invasive cancer of the cervix from 11.7 in 2007 to 12.2 in 2009, 13.2 in 2012 and 14. 9 2015 . This increase is due -almost exclusively- to young women, which include all vaccinated, as evidenced by the sharp decline of the average age of onset of the cervix cancer from 48 years in 2002-2006 to 45 years in 2012-2016. During the same period, a decrease in the incidence of invasive cancer was observed in older women, not involved in the vaccination program: -11% for women aged 55 to 64 (15.47 to 13.7), -16% for those aged 65 to 74 (17.7 to 14.71) and -29% for those aged 75 to 85 (18.39 to 13). In this country, vaccination coverage is lower than in previous countries (close to 60%). 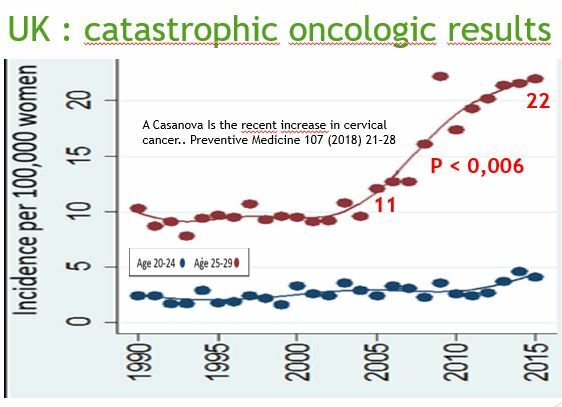 According to the Cancer Statistics Review 1975-2015 , the standardized incidence of invasive cervical cancer remains stable (+0.1) since vaccination. In US, the same discrepancy is observed according to age groups, but of lesser amplitude. Women over 50, benefit a 5% decrease in their risk (from 10.37 per 100000 in 2007 to 9.87 in 2015), whereas younger women, which include vaccinated, have given their risk increase of 4% (5.24 in 2007 to 5.47 in 2015). The evolution of these countries, with high immunization coverage, can be compared to the trend observed in metropolitan France, where HPV vaccination coverage is very low (around 15%). France can be considered, for this reason, as a control country. In France  the incidence of cervical cancer has steadily decreased from 15 in 1995 to 7.5 in 2007, 6.7 in 2012 and 6 in 2017, much lower than those of countries with high vaccine coverage. This decrease in incidence was accompanied by a decrease in mortality from 5 in 1980 to 1.8 in 2012 and 1.7 in 2017. It is paradoxical and very worrying that these excellent French results, with low cervix cancer rate and low related mortality, could be jeopardized by an obligation considered in the short term by our policies, for some misinformed and other big pharma links . DRAMATIC AND UNEXPECTED PARADOXICAL EFFECT OF GARDASIL: THE ALERT MUST BE GIVEN TO DECISION MAKERS AND THE MEDIA. In all countries that achieved high HPV vaccination coverage, official cancer registries show an increase in the incidence of invasive cervical cancer. For women under 20, the crude numbers are too small to reach statistical significance, but the similar increases in all the studied countries constitutes a strong alarm signal. For women 20-30 the incidence increases after catch up vaccination, and is highly significant (p<0.01or 0.001). In these same countries, during the same period, older women, not vaccinated, have seen their risk of cervical cancer continue to decline. Similarly, in metropolitan France, a country with low vaccination coverage, the incidence of cervical cancer continues to decline at a rate comparable to the pre-vaccination period. These paradoxical results plea for a rapid revision of recommendations and intensive research to explain this catastrophic issue. 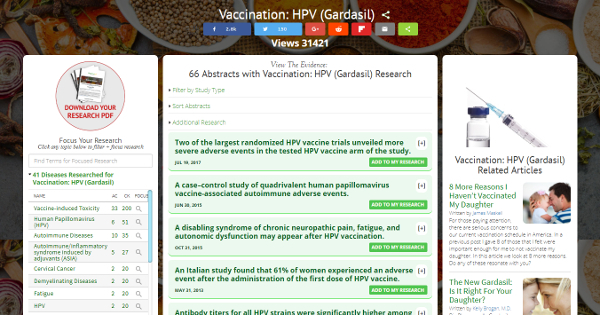 For additional research on the health risks of the HPV vaccine, visit the GreenMedInfo database on the subject. 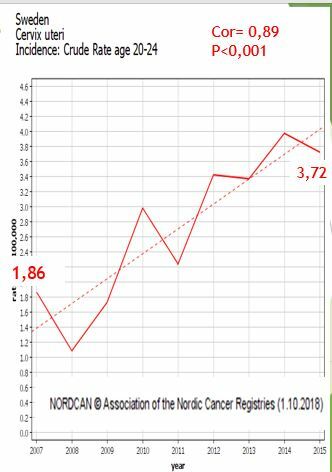 Engholm G, Ferlay J, Christensen N, Hansen HL, Hertzum-Larsen R, Johannesen TB, Kejs AMT, Khan S, Olafsdottir E, Petersen T, Schmidt LKH, Virtanen A and Storm HH: Cancer Incidence, Mortality, Prevalence and Survival in the Nordic Countries, Version 8.1 (28.06.2018). Association of the Nordic Cancer Registries. Danish Cancer Society. Available from http://www.ancr.nu, accessed it 30 / 09 / 2018.
 https://www.agoravox.fr/tribune-libre/article/gardasil-alerte-risque-imminent-d-206314 Gardasil, alert, imminent risk of mandatory vaccination against HPV unnecessary, and sometimes dangerous, for girls and boys. A full-time hospital doctor, Nicole Delépine has been fighting for 20 years to improve care for cancer patients. She is the author of about 100 original articles on the subject and has presented, in recent years, an average of 15 annual papers, of which 2/3 in international congresses. Chris Savage, formerly an Australian Police Sergeant of 22 years experience, observed a correlation between so called shaken baby suspects (the parents/caregivers) and vaccine delivery. When he blew the whistle on this he lost his career. He’s gone on to speak about this correlation & is interviewed here by Dr Rima of Natural Solutions. There are links below to their work & YT channel. I’ve also posted a video of Chris Savage speaking at a rally in Brisbane, if you would like the short version of information that he offers. Note he also mentions the flu vaccine where the common scenario is shot, followed by flu, followed by pneumonia, frequently followed by death. I have heard of at least 3 cases like this in my own small circle in NZ. Thanks to Clare Swinney for this video. And note, this is about informed consent. One hour after her 6 week old baby was vaccinated, this young mother says her baby woke up screaming, over two days he turned into a floppy rag doll with a high pitched shrill moan … his brain was swelling. Listen to the video recording from NewstalkZB. Sharyl Attkisson, an intrepid and forthright journalist, formerly with CBS TV News, has been persistent in her media exposures regarding vaccine-caused health problems, especially the Autism Spectrum Disorder (ASD), ever since she did an in-depth report for CBS, which the media bosses refused to broadcast. That led to Sharyl’s independent journalism programs, a blessing in disguise. Recently, Sharyl exposed that CDC’s expert vaccine witness, who previously debunked vaccine autism claims during Vaccinees Injury Masters hearings, Dr. Andrew Zimmerman, a pediatric neurologist, told CDC “long ago” that vaccines could cause Autism, but they refused to accept Zimmerman’s information. Instead, Department of Justice [DOJ] lawyers immediately fired him. Attorney Rolf Hazelhurst, a criminal prosecutor, has a vaccine-damaged and autistic son, Yates, born February 11, 2000. As a result of what the Hazelhurst family has gone through, Attorney Hazelhurst has become an avid vaccine-safety rights legal counsel. Furthermore, he had Dr. Zimmerman evaluate Yates. As a result of intensive treatment for autism, Yates is doing much better. Mystery Molecule in your Baby’s Shots? he Office of Refugee Resettlement (ORR) requires that all unaccompanied alien children (UAC) be vaccinated while in ORR custody in accordance with the Advisory Committee on Immunization Practices (ACIP) catch-up schedule (see this). The potentially lethal schedule mandated by the Centers for Disease Control (CDC) ACIP or ages 7 – 18 are acknowledged by the CDC. An unknowable number of the vaccines can be expected to be contaminated with dangerous extraneous substances, depending on the country of origin and the sloppiness with which the vaccine batch is manufactured. If all these vaccines are injected at one sitting (as can be expected at the ORR), some of the children will likely develop some sort of (acute and/or chronic) vaccine-induced illness, and some will certainly be so seriously poisoned that they will die. Given the bureaucratic “efficiency” (and total lack of informed consent or adherence with the Precautionary Principle) with which most children in the US (not just immigrants) are dealt with by American Academy of Pediatrics (APP) pediatricians in their offices, none of the “despised” non-white immigrants kids will have their immunization histories checked prior to the inoculation cocktails being given. Thus unknown percentages of children who have already been fully vaccinated in their homelands will be at risk of having anaphylactic reactions from the second or third dose of a inoculum to which they had developed a mild allergic reaction (which sets them up for a more serious anaphylactic reaction when the next shot is administered). Infanrix Hexa is used widely in the international market. The vaccine is all risk and literally no benefit. Its use should be stopped immediately, pending future investigation. If their testing continues to reveal ever more inconsistencies, GSK could be in serious legal problems for inappropriate labelling, poor manufacturing processes and perhaps even charged with murder. (Natural News) You’ve heard it before and you’ll hear it a hundred times again: The herd theory hoax that claims vaccines don’t work unless everyone gets vaccinated. Sure. And how is that? If the vaccines work, why would all of those people inoculated still be susceptible to getting the disease? It doesn’t make sense, unless you consider the fact that most vaccines are just a “shot in the dark” – an experimental guess at certain viral strains, mixed with neurotoxins, carcinogens, allergens, other animal’s blood and cells, foreign proteins, all combined and injected into muscle tissue with chemical adjuvants in hopes of stimulating a hyper-immune response that’s sadly short-lived, if it even works at all. In other words, if you’re afraid of unvaccinated children, then that must mean your vaccines don’t work. And that is exactly why herd “vaxxers” are still paranoid about anyone who doesn’t follow the rules of the “sheeple” and get every vaccine, booster jab, and flu shot that anyone tells them to get. Consider another angle that exposes herd theory idiocy. Vaxxers all believe they are safe in the herd of people that get vaccinated, but most of that same “herd” supports open borders, where “herds” of thousands of illegal aliens in caravans flood into their city or town with viruses they’re not vaccinated against. American vaccine-manufacturing scientists, corporate shills, the media, and medical parrots (M.D.s and nurses that repeat the same illogical vaccine mottos) all want us to believe that the human immune system is naturally weak, and that if you catch any infectious disease that your likelihood of dying from it is very high. That’s why open borders are the antithesis of the herd immunity theory, but people who are vaccinated are so “intoxicated” with heavy metal poisons, formaldehyde, and aluminum that they can’t think clearly enough to make sense of it all. They live in fear. Plus, the CDC preposterously exaggerates the statistics of influenza deaths. It’s all fear mongering and fear-based propaganda to sell more vaccines by getting all the injected sheeple to regurgitate their lies to their friends, relatives, neighbors and coworkers. The fact is that if you get vaccinated, you are more likely to come down with infectious diseases, including lung infections from virus and bacteria. That’s because injections of known neurotoxins and carcinogens severely compromise the immune system, all while the very viruses you’re afraid of catching are injected into you by Big Scam Pharma. If vaccines are so “safe and effective,” why has the vaccine court paid out $4 billion in damages over the past couple decades? Here comes more vaccine logic dismantled: If vaccines are so safe and effective, why can’t parents of vaccine-damaged children sue the drug companies that manufacture the vaccines? Think about that for a minute. Imagine if some car parts manufacturer made brake pads, but if the brake pads were defective and caused horrible wrecks, you couldn’t sue them?